Spread spread was exactly as described. 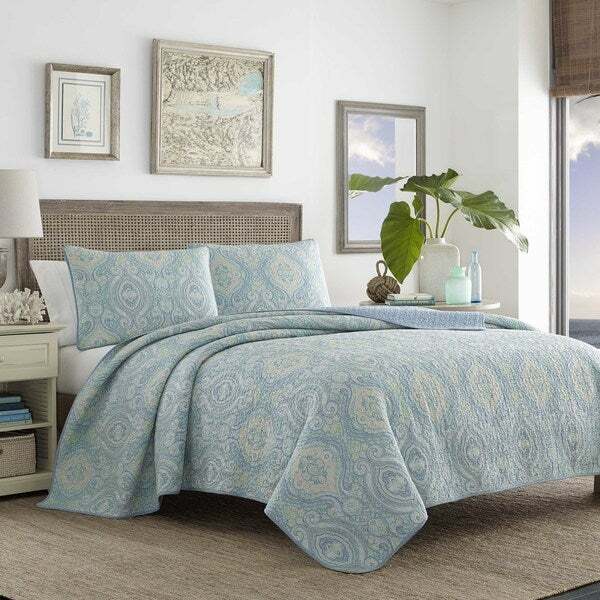 Bring a new and casual look to your bedroom with this blue cotton quit set. This set is made of 100-percent cotton and features a lovely floral blue design. it reverses to a weave textured print in a pale aqua blue color. Add a warm and cozy feel to your bedroom with this stylish set. I purchased this quilt for my guest room which happens to be the coolest room in the house. The colors as shown on the website are pretty much accurate and very beautiful without being too feminine. My wall are painted a very light grey-blue and this quilt complements them well. I could also use this in our master bedroom which has two shades of blues on the walls. One is a medium french blue and the other a deep blue. It looks beautiful in either room. It was easy to find accent pillows at a Home Goods store. I chose a light silver grey and one white and it looks stunning. The only reason I did not give it 5 stars was because it is a very lightweight quilt and if you need some warmth you would have to add a heavy blanket. Chose this comforter bc I love Tommy Bahama products and this one didn't fail. Colors are subtle but pretty and fit our beachy theme. Note: the yellow in the pattern is actually a green, but I still love it! It is not heavy in weight so my husband likes it too. Looks so pretty in my bedroom which is painted Sherwin Williams Sea Salt. The sides definitely come down long enough to meet the bedskirt. Great weight for spring and summer. The colours and print are lovely, but the quilt itself is very light and the shams are not very well constructed. Both are quite small, so if you have a queen size bed, I would recommend going for the king size, as the full/double is a bit short at the sides / end, and the shams are tiny. I love this Quilt Set! It is a beautiful pale blue. Blue’s are not easy to decorate with do to all the different shades...but this Quilt Set seems to go with most blues. The quality is excellent. You will not be disappointed! 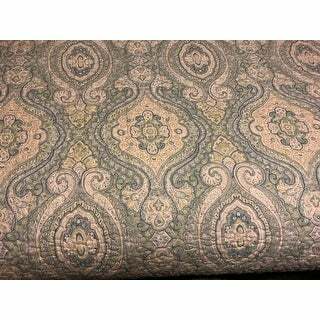 Truly beautiful 100% cotton quilt with hues of blue and touch of pastel green. This quilt has a soft, but spirited tropical feel. I still think they could have made it wider to hang over the sides of our king sized bed just a tad more since we have deep pocketed sheets to cover our memory foam mattress. Even though, it’s enough for now, however, I expect it to shrink somewhat after washing and drying. Still a great quality quilt set that includes two generous king-sized pillow shams. Arrived on time and in tact. Awesome value considering overall cost. Would buy Tommy Bahama again...Overstock has super prices! Very pretty set, ordered for my mother's new home. It's very wide and easily fell to the floor - a king size on a queen bed. Colors are light and airy. 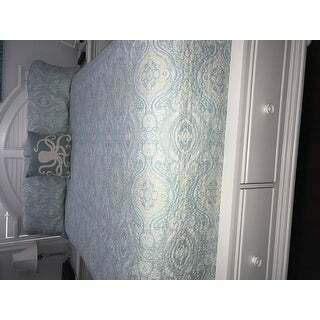 The Tommy Bahama Turtle Cove Blue Cotton Quilt Set is awesome! I used it in a beach house rental property that I manage and it looks very nice. It's easy to wash and holds it's beautiful color. Absolutely beautiful! Colors are soft and pale: ivory, blue, grey & green. Very serene look and will complement my coastal design for a new shore home. I wouldn’t characterize the blue as aqua. It’s more of a blue grey. Due to listing error by Overstock, it took three tries to get the aqua option. Blue was shipped the first two times. I love the seaglass colors. Perfect weight for Florida. Cotton fabric breathes, and is just right. Well made, and comes with two shams. Purchased king for my queen bed, for better coverage. Worked out perfectly. Very pretty and nicely made. It matches the paint in my bedroom really nice. The color of paint is BMoore Grey Owl . The print is not to bold but just right. The size of my king size was a good size better than some I bought. So I am very happy with this purchase. We wanted a lightweight, breezy quilt and this is perfect! Not too heavy and not too light. Exactly the soothing shades of blue and green that I was looking for. Ordered two full sized quilts for our lake house bedroom. Love them! They are just the right weight for summer and for winter with an added blanket. The full size is generous - I can get by without a bedskirt. Many colors to pick up for wall color. They are soft and provide a soothing bedroom. Delivery was prompt. Very happy! Love the muted colors. The fabric is soft and lightweight...just what I need for a cool Florida night! This quilt is very light and soft. I am a hot sleeper and it is perfect. Love the refreshing colors. This is a beautiful quilt! I ordered a king for my queen bed as I have it raised. I do wish it was a foot longer to hang more over the foot of the bed. Oh well, if I don’t pull it all the way up to the head of the bed it works. Also I wish you could order the pillow shams separately because the king quilt comes with huge pillow shams that are far too large for my standard pillows. It is a beautiful quilt though. The pattern is so pretty and the colors are soft. Very nice quilt, colors really pretty. I did return it though because the pattern was very busy. Exactly what I wanted. Color is true to the image. Large enough to easily cover my king size bed. This quilt set is very calming and tranquil. It is large enough for my king bed but I have heard it can shrink do be careful drying it. The colors are not exact to the picture more blue then aqua. I am very happy with it. "Is this quilt extra long? Does the king size repack the bed Skirt?" It is not any longer than a normal king sized quilt or comforter. It is gorgeous! "What color bedskirt pairs with this set? " We used an offwhite bedskirt, but I think you could easily use a white or grey or soft blue. The colors blend easily with everything. I used it with a natural linen bed skirt and it looks amazing! "On the website the blue and aqua pictures appear the same... Is there a difference? Also does anyone know if the king size would fit a California king bed? Thanks in advance "
The blue is much darker than the aqua. I have ordered aqua twice and twice have been sent blue. I have notified them about the problem, which has not been resolved . "Is there any grey in this quilt." Liked the colors, seems like good quality and value. It's serene looking. And beachy looking! Love the colors!